There are contraindications. Consult a doctor. Consult a specialist. For children from 11 months. Item's design bears resemblance to weapons. Project declaration on advertised site. Developer “Teremok” LLC. Consulting in selection of financial services/organizations. Warnings are added automatically to text ads, whereas they have to be added manually to image ads. Categories are determined based on the ad's content (title, text, sitelink description), as well as the content of the landing pages. Therefore, even if the ad does not advertise, for example, drugs, but there is a drug name in one of sitelink descriptions, the corresponding warning will be added. If the products/services you advertise do not fall under any of the categories listed above, but a warning was added to the ad, please contact the support service using the feedback form, to remove the warning. The “Consult a Specialist indication. For baby food intended for children 11 months and older ” should be added to ads for children's food. Warnings are added automatically to Text & Image Ads, whereas they have to be added manually to image ads. If your products address younger audience, you can change the rating on your own at the advertising campaign page. If the products/services you advertise do not belong to any of the abovementioned categories, but an age rating has been added to the ad, please contact the support service using the feedback form to remove it. All information required by legislation and Yandex's Ad Serving Rules must be present in video extensions and video ads. 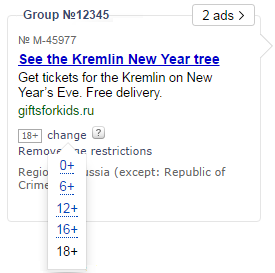 As for Text & Image ads, age limits and warnings will be added automatically. The source of the advertised product or service must be explicitly indicated in the ad. You can meet this requirement using the logo, the full name of the individual entrepreneur, or the brand name (or company name). The advertising of sales must contain the dates and/or duration of specific offers. For example: the competition runs from 10/07/2016 until 30/07/2016. Information on the organizer, rules, dates, as well as the amount of prizes and where and how they are received can be found on the site www.example-site.com. The advertising of financial services must contain the name of the legal entity and details about its organizational and business structure and the source of information which is subject to disclosure in accordance with the legislation of the Russian Federation. The information must be clearly visible to the user without the need of any special tools or requiring any additional actions. Text font must be readable at the minimum resolution. The information must remain visible long enough on screen for the entire text to be read at an average reading speed (150 characters a minute). Ads for assistance in selecting financial services and organizations must contain a warning, such as “Consulting in selection of financial services/organizations”. All information required by legislation and Yandex's Ad Serving Rules must be present on the creative for an image ad. Any required labels and restrictions must be added before the creative can be uploaded. Advertising products and services, which are covered by the Russian Federal Law “On Protecting Children from Information Harmful to Their Health and Development”, must contain age ratings (0+, 6+, 12+, 16+, 18+). The advertising of medicines, medical equipment, and medical services (including treatment methods) must contain a warning about the presence of contraindications, the need to read the instructions for use, or to consult a healthcare professional. The warning must take up at least 5% of the area of the image ad. The advertising of dietary supplements (biologically-active additives) must contain a warning that the advertised product is not medicine. The warning must take up at least 10% of the area of the image ad. Ads for Forex market services must contain the name of the legal entity providing the services, information about its legal form, and a free-form warning about potential risks (for example, “FinTrust, LLC. The financial instruments being offered entail risks and can lead to the loss of all invested funds”). The information must be clearly visible to the user without the need of any special tools or requiring any additional actions. Text font must be readable at the minimum resolution. The information must remain visible long enough on screen for the entire text to be read at an average reading speed (150 characters a minute). Ads for businesses that take/place bets should contain the following: “Information about the organizer of the gambling event, participation rules, the duration of the event, the number of prizes or the maximum amount of winnings, the location of the event, and how prizes are awarded on the advertised site”. Ads for certification centers or intermediary services that accept and review documents should contain the name of the legal entity/full name of the individual entrepreneur providing the service, and the accreditation record number in the register of accredited persons (for example “ Certificate, LLC. # RA.RU.12AB34”). The information must be clearly visible to the user without the need of any special tools or requiring any additional actions. Text font must be readable at the minimum resolution. The information must remain visible long enough on screen for the entire text to be read at an average reading speed (150 characters a minute). If the subject of your ad is certification assistance (but you do not accept or process documents), the following notice will automatically be added to your text ads: “Consulting in selection of certified persons for evaluation (confirmation) of compliance”. The advertising of products similar in construction to weapons must contain a warning stating that the product is not a weapon.